Home›News & Events›Noise Solution comes to London! Noise Solution comes to London! This article has been written by Noise Solution Senior Musician Micheal Goodey. Noise Solution is an organisation focused on impacting on well-being. 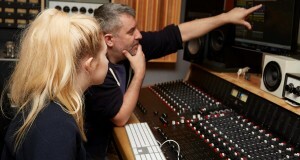 Working predominantly with young people in challenging circumstances we have developed an evidence-based intervention that combines one-to-one music mentoring and a digital platform that enables family and professionals to focus on the strengths of participants. It’s an approach that has proven to be highly statistically significant in increasing well-being, with often transformative results. Noise Solution methodology arises from £100k investment in research and development over the last 5 years, plus a two year research masters at Cambridge University. This has led to the development of a social media platform designed specifically to support, compliment and reinforce an individualised music mentoring programme, focused on music technology and beat making. Noise Solution recently partnered with Anglia Water to create a film that showcases the impacts the organisation is having. The film was shown at the responsible business awards, held at the Royal Albert Hall, and you can view the film here >. The programme is one-to-one, runs for ten weeks (two hours per session) and aims to re-engage or change trajectories for those who are stuck in a rut, or are not engaged with services. We do this through the use of music technology (writing, recording, documenting and sharing the process). The software we use is free, so is still accessible to participants after they have finished the programme. After nine years working across the east of England, Noise Solution is coming to work in Greater London as part of a national expansion plan. Commissioners include local authorities, NHS trusts and other statutory partners.